This has been quite a year for 2D platformers, seeing the release of such titles as Donkey Kong Country Tropical Freeze (technically 2.5D, but the play style is the same), 1001 Spikes, Shovel Knight and Guacamelee Super Turbo Championship Edition (I know that one is not technically a new release, but close enough) among others. It has simple been a great year, with several more due over the next few weeks. Even though I was greatly anticipating Shantae and the Pirate’s Curse, I am shocked about how good it is. I wanted it to be this good, but I really didn’t expect it. Wayforward’s original forays are almost always worth playing, but they also tend to be flawed. Shantae and the Pirate’s Curse is their original masterpiece. I love Wayforward; they make good games. Most of their output is licensed titles of variable quality. There is an underlying level of competence to even the bad ones that makes any Wayforward game worth giving a look. Their Adventure Time games are pretty good and their superhero games, Batman: The Brave and the Bold and Thor, are solid beat-em-ups. They are good, but not great games. Then they have a handful of remakes and re-imaginings; which is largely their best output. Contra 4, A Boy and his Blob and Double Dragon Neon are all excellent games. But those are all built upon pre-existing works. They are refinements of existing templates. That is not meant to diminish them, again they are great games, but they feel in a small way like they are not Wayforward’s games. Wayforward’s original titles haven’t been bad, only small. The original Shantae is a fine game, but it chafes against the limitations of its platform. The GBC is not a great system for action games. While Shantae looked good it was an uneven title. 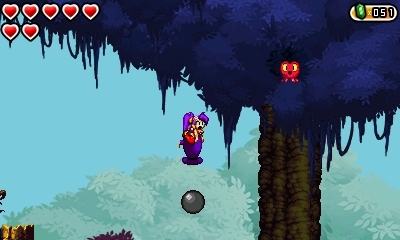 The difficulty is frontloaded and Shantae’s sprite, while great looking, is a little too big for the small screen. The loosely tied Mighty series of games a delightful, but they are also bite-sized. Shantae: Risky’s Revenge was just short of being great. It is very, very good, but there are a just too many small problems. The game can be a chore to navigate and it, like the Mighty games, is just too darn short. Shantae and the Pirate’s Curse, though, irons out all those flaws. It is a meaty game, a good ten hours long the first time through and never tedious or repetitive. It finally becomes the true Metroidvania that the previous two games hinted at, though it still somewhat level based. The individual areas do not connect like the areas of Super Metroid, but it does nail that free roaming exploration feel. In practice it feels like Monster World 4, but with the ability to backtrack. It is just a finely tuned game. Shantae’s hair whipping attack always looked good, but this time it actually feels like the attack has enough range. The heroine has lost her transformation abilities, but the new pirate themed skills she acquires more than make up for it. The transformations were great, but the pirate skills are smoother. It is easier to flip between them. The whole game just feels perfectly honed. It is impossible to talk about this game without mentioning the graphics. Many 2D games go for a stylized self-consciously retro look. Shovel Knight does its best to look like an NES, 1001 Spikes looks like something older. Anything that tries to look newer inevitably goes 3D. 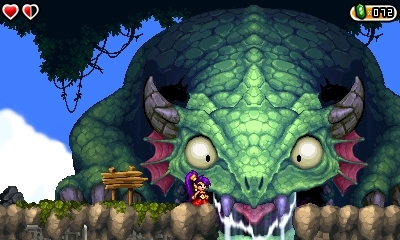 Shantae and the Pirate’s Curse is 2D, but it isn’t trying to look old, it simply looks great. It looks like a 16-bit game on steroids. It also uses the 3D capabilities of the 3DS to make the sprite layers look great. Everything just looks great. It also sounds pretty good as well. This game is seriously the best case scenario I imagined when Wayforward announced that this game was coming. But it kept getting pushed back, the release date was constantly uncertain and they did a kickstarter for a new Shantae game in between the time this game was announced and when it released. I never really thought the game was in trouble or anything, but I expected it to be a little flawed. They seem to have taken the Nintendo philosophy with delays, that it is better to delay a game and fix it than release a flawed game on time. That is unusual, only Nintendo has my faith to pull it off, but Wayforward did it with this game. Shantae and the Pirate’s Curse is the best possible game it could be.